Mike Salts from the Portland Bureau of Transportation bridge maintenance crew makes repairs to the SW Capitol Highway bridge onramp to SW Barbur Boulevard. Photo by Lisa Perry, Portland Bureau of Transportation. 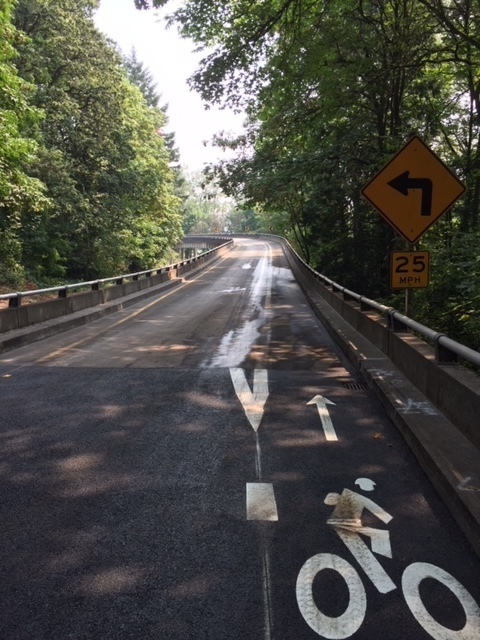 (August 15, 2018) The SW Capitol Highway flyover ramp connecting to SW Barbur Boulevard was reopened today at about 2 p.m., after Portland Bureau of Transportation crews completed repairs to the structure nearly two weeks ahead of schedule. A hole in the bridge, discovered on July 19, led to an immediate closure to all traffic with reopening set for August 27. Thanks to Portland Bureau of Transportation crews, deteriorated concrete around an eight-inch hole in the deck of the flyover ramp connecting eastbound SW Capitol Highway to northbound SW Barbur Boulevard was demolished and replaced over the course of three weeks. 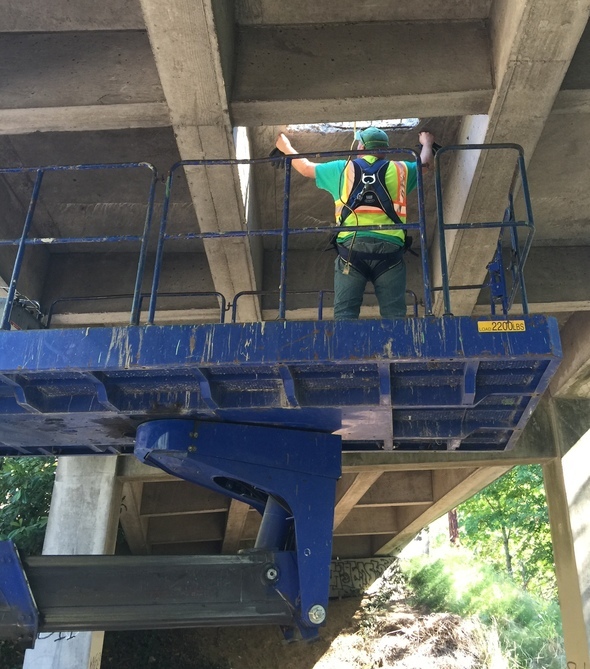 During the closure for the concrete repairs, City crews also repaired deteriorated concrete discovered at a second location, repaved the bridge approach, cleared clogged deck drains, and trimmed back overgrown vegetation. The 554-foot-long and almost 60-year-old steel-and-concrete girder bridge is owned by the Portland Bureau of Transportation. Based on National Bridge Inspection Standards, the Oregon Department of Transportation inspects this and all other public, traffic carrying bridges in Oregon every two years. The bridge is due for its next inspection this September. The newly repaired bridge. Photo by Lisa Perry, Portland Bureau of Transportation.